Perhaps you have found yourself in this situation. Your team has been diligent in using a structured process to solve a vexing problem. Most everyone seems to be engaged. Quite a few ideas have been generated. The team has used a criteria matrix or other sorting tool to narrow the choices to the best solution. It seems clear what action is next. The group needs to decide how to implement the improvement. There is an uneasiness in the air. You can sense it. You can see it in the way that Jennifer is tilting her head as the team’s proposal is summarized. Susan wonders aloud if the crew will accept this new process design. At a time like this, it might be helpful to put on a hat. Or better yet, six hats. Edward de Bono’s Six Thinking Hats® is a simple, but powerful tool set that uses a parallel thinking process to help teams be more focused and productive. Using this process, team members learn how to separate thinking into six clear functions and roles. Each thinking role is identified with a colored symbolic “thinking hat.” By mentally wearing and switching “hats,” you can easily focus or redirect thoughts, the conversation, or the meeting. The process can be used to generate ideas, but it is especially helpful when assessing solutions after the group has narrowed the list of ideas down to a couple of viable options. A summary of these hats and their associated meaning is given below. During the exercise, someone serves as the facilitator by wearing the blue hat. The ground rules and sequence of hats is explained. Each hat is “worn” in a prescribed sequence (usually in the order portrayed in the previous section). Individual thoughts or ideas are encouraged – but only with respect to the color of the hat that is being worn at the moment. Time for each hat is limited to 1-5 minutes (except for the red hat: allocate less than 1 minute for this one). Assign a scribe to take notes. Or, it may be easier to have each participant capture their verbal thoughts on a sticky note and post these on a board as the discussion proceeds. The group reviews the responses that were captured while each hat was being worn. Actions are taken or assignments are made to address the concerns, issues or ideas that surfaced. By using this technique, the group is much more likely to be aligned on the path forward. This is an effective way to understand what is not being said. As a result, any concerns can be addressed and everyone in the group has a renewed sense that their voice has been heard. It is much more likely to gain “buy-in” for any decisions. I have used the Six Thinking Hats® in a creativity setting. Although the participants were a bit skeptical when the process was first explained, afterward they felt good about the outcome. The team sensed that they had passed a critical checkpoint. They were now ready to move to the implementation phase of the project with confidence in the solution and in one another. 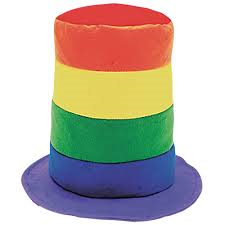 If your tea m lacks focus, struggles to collaborate, or seldom explores alternative ideas, it could be that each person is (metaphorically) wearing a multi-colored hat like this one during your meetings. As discussed in an earlier post about the Abilene Paradox, it is essential to create a forum where candor is welcomed. Consider using the Six Thinking Hats® process to make sure that everyone’s views are expressed in a healthy and productive way.